In a salad or sandwich, you don't need peeled tomatoes. If you're making a fresh tomato sauce or stewed tomatoes, the tomatoes should be peeled, cored, and seeded. The result will be a smoother sauce without any seeds, core, or peel in it. Don't worry, it's an easy and quick process. 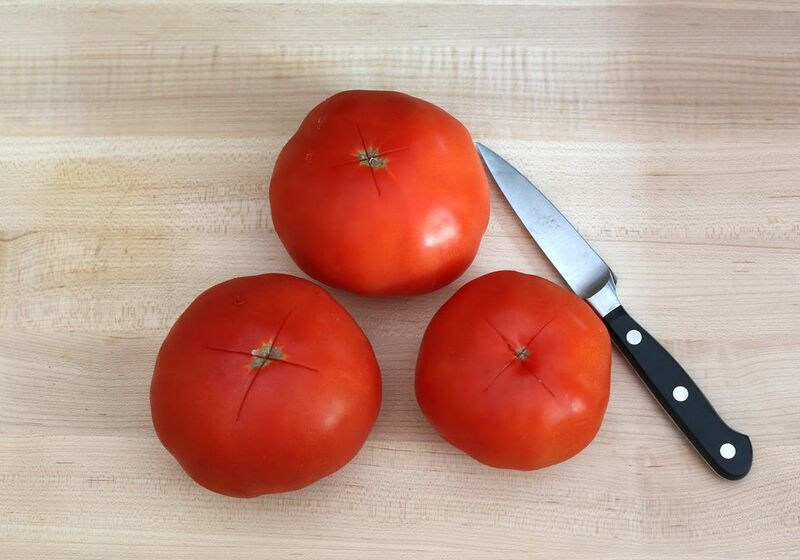 Place the tomatoes on a cutting board, stem-side down. Cut a shallow X in the bottom of each tomato. If you plan to core the tomatoes, you may do so now or do it later when you remove the skin and or seeds. If you want to core the tomatoes now, make a deep cut next to the stem end. Holding the knife at an angle, cut around the stem. Remove the center of the tomato, any stem, and where the stem connects to the fruit. Using tongs or slotted spoon, place tomatoes, two or three at a time, into rapidly boiling water. Let tomatoes boil for about 15 to 25 seconds. The skins should just begin to split around the "X." Don't leave the tomatoes in the water for more than 60 seconds. Otherwise, the tomatoes will be slightly cooked. Using the tongs or slotted spoon, transfer the tomatoes from the boiling water to a large bowl of ice water. Immerse them completely in ice water. Repeat steps until all tomatoes are in the ice water, ready for peeling. When the tomatoes are completely cool, remove them from ice water and pat dry. Starting at the "X," begin to peel the tomato skin away from the "X". If necessary, use a small sharp knife to peel the skin. If you prefer, core the tomatoes now if you didn't in step 1 (using the same technique). Cut gently as the boiled tomato may be more fragile. To seed the tomatoes cut them in half crosswise. Cut carefully, since peeled tomatoes are extra slippery. Scoop the seeds out with a small measuring spoon or your fingers. If you're making a soup or sauce, put the discarded tomato pieces, peels, and seeds in a sieve over a bowl to catch any extra juices. Use the juices in your recipe or refrigerate or freeze for another use. If any tough core pieces remain, cut them out and discard. The fresh peeled tomatoes are ready to use in your favorite recipes, including salads, sauces, or garden-fresh gazpacho. 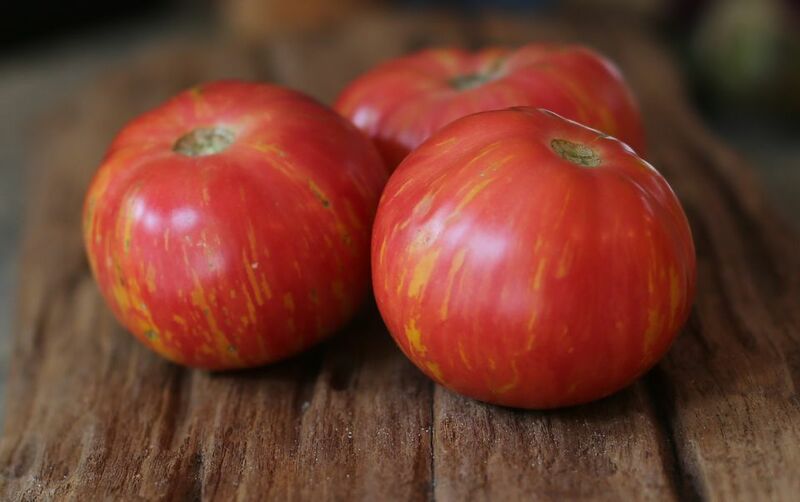 If you prefer, you can peel, core, and seed a large batch of tomatoes at the height of tomato season. Place the prepared tomatoes into labeled zip-top bags and freeze them. The bags stack well in the freezer and are easy to defrost under cold running water. Take a bag out of the freezer whenever you want the sweet taste of summer tomatoes.